Stack the odds in your favor of having a positive birth for you, your baby and your partner. You’ve heard the horror stories that everyone can't wait to tell you. You've seen the TV shows. You’re wondering if there is a way that you can give yourself the best chance of a positive birth, a birth where you and your partner can feel calm, confident and in control. The GentleBirth Antenatal Workshop is the only class in Ireland that focuses solely on birth preparation for the biggest day of your life - and your baby's. If you think hypnobirthing is only for 'earth mothers' - read on. Most couples come to the Gentlebirth workshops not because they are completely ruling out the epidural but because they want to do everything they can to have a positive experience. The epidural can be a great tool for labour, if needed, but after your GentleBirth workshop you and your partner will have a multitude of birth 'tools' and strategies in your labour 'toolkit'. With over 85% of GentleBirth mums not needing an epidural you're already off to a good start. Mums who attend GentleBirth workshops are from all walks of life - teachers, stay at home mums, scientists, midwives and more. Like you, they've all heard the scary stories and have decided to stack the deck in their favour of having a great birth experience rather than leaving the biggest day of their lives up to chance. GentleBirth is the only birth preparation class of its kind in Ireland. This workshop is for parents who want to be actively involved in decision making and prefer to have an understanding of what choices are available to them for labour and birth in Ireland. You and your partner will learn a LOT more than just self hypnosis. Hypnosis is just one of the many tools you'll have to use on the big day depending on your individual needs. Is your partner prepared for labour? It's no secret that most hospital classes don't prepare Dads adequately for birth. Your partner has a huge role in your baby's birth and most Dads are very eager to understand what they can do to help. During the workshop you and your partner develop a clear understanding of how to navigate and negotiate the overstretched busy Irish maternity system confidently and calmly. Dads/birth partners appreciate the importance of their role as birth supporter, facilitator and advocate on this very special day. GentleBirth preparation weekend workshops combine birth hypnosis (deep relaxation for pregnancy and labour) and active birthing principles enabling couples to have empowered, confident birth experiences with or without medical intervention at home or at the hospital. When is the best time to come to a workshop? As soon as you want to start really enjoying your pregnancy - we see couples as early as 9 weeks and as late as 41 weeks. It's never too early, and only too late after your baby has arrived. Although labour and birth is a serious topic the workshop is a lot of fun (don't worry nobody will be going home barking like a dog!). There's plenty of practice too so it makes for a very relaxing, informative weekend. What happens on admission to hospital? Why you don't have to push! You also receive the complete GentleBirth Antenatal Program Box Set which includes 8 CD's and the GentleBirth Guidebook. During the workshop you'll meet other couples who also want to have an active role in working towards a very positive experience. It gives you and your partner a wonderful opportunity to escape life's day to day demands and just focus on each other and your baby for a weekend. You and your partner will leave the workshop feeling excited about labour - with no fear and ready for the great adventure of parenting - now immune to the scary stories everyone can't wait to tell you. 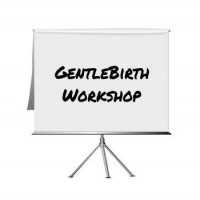 When you add the GentleBirth Antenatal Workshop to your shopping cart you will be asked to choose the date of the workshop you would like to attend. Workshop places are limited - when we receive your payment we will confirm that the date you have selected is available within 48 hours.